Sadie's Birthday, originally uploaded by The Bacher Family. First birthdays are so much fun! They always get a cake, and the person turning one is always so astonished by her good fortune at having an entire sweet thing to herself. Is this for real? Is this really all mine? Can I really put my hands into the frosting without getting in trouble? 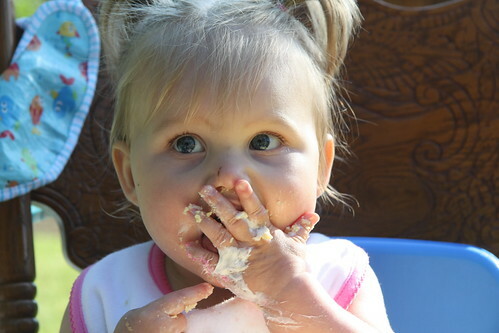 You can see Sadie checking for her mother's reaction as she licks the yummy frosting off her hand.